em) in medieval Prague, who was made by Rabbi Loew, and was brought to life to deliver the Jews from the oppresion of the medieval lords THE UNKNOWN PURPLE - Silentifilm made about 1928. Pdrod. and cast not known. Suggested from a story in the ELECTRICAL EXPERIMENT called AT WAR WITH THE INVISIBLE in March and April 1917 issues. Inventive genius, experiments with ultra-violet light to produce invisibility. Inventor is thrown into jail, and loses his sewwtheart to rival, thru rival's financial manupulations - During twenty years jail term, he perfects his divice, which covers him with a cone fo purple light, apex at head, circular base at feet vice and persecutes his enemy. Weird effects of cone of light walking about, with no one inside it. In the end the rival capitulates, makes everything good and love triumphs over all. THE MYSTERIOUS ISLAND - MGM - Stfilm in Technicolor, made in 1926 Starring Lionel Barrymore. Part talky, part silent with sound effects. Lionel Barrymore. Part talky, part silent with sound effects. Lionel Barrymore, a scientific student of the sea, has been collecting odd objects in the form of semi-human bones, found floating on the surface of the sea near his seashore laboratory - - the picture opens with the finding of a jawbone completing a midget semi-human skeleton. This crystallizes the scientist's plans to build a super submarine to go to the bottom of the sea, and find these creatures if theys really existed. The trip is successful and the beings (called the "ichthyolites") are discoreved. An attack by a huge octupus which almost gaings the interior of the recall rest of film, except that lionel dies at the bottom of the sea. Presenting Mario Racic Jr. Mario Racic, Jr. has long been interested in scentifilms. Long vefore FANTASY-NEWS was thought of, Mario was collecting scientifilms stills, and he still does. He is now all ready to big for those JUST IMAGINE stills. Horning has present for THE WORLD STF CONVENTION Stfilms being his hobby, we naturally ask him to do a SCENTIFILM column for FANTASY-NEWS last wear. "Sure", says He, "I'll do it." and every week since he's send in a SCIENTIFILM column and is now well liked by the readers of FANTASY-NEWS. 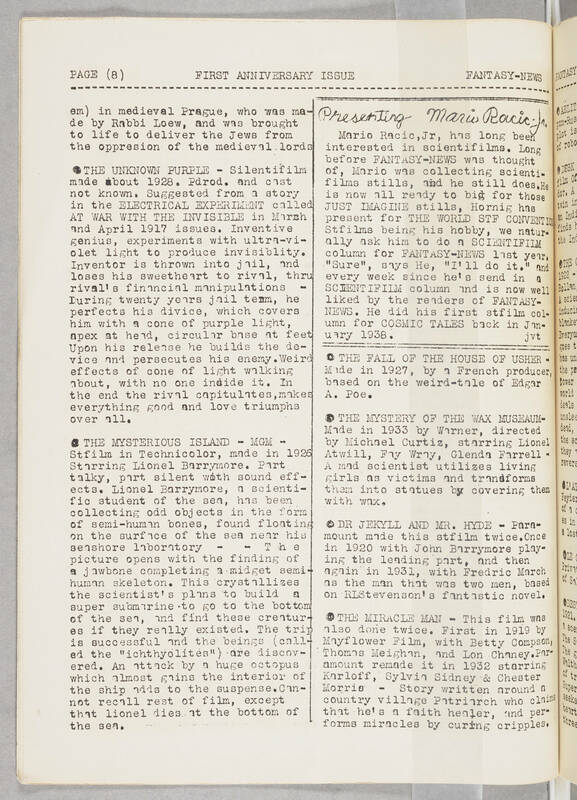 He did his first stfilm column for COSMIC TALES back in January 1938. THE FALL OF THE HOUSE OF USHER Made in 1927, by a French producer, based on the weird-tale of Edgar A. Poe. THE MYSTERY OF THE WAX MUSEAUM Made in 1933 by Warner, directed by Michael Curtiz, starring Lionel Atwill, Fay Wray, Glenda Farrell - A mad scientist utilizes living girls as victims and transforms them into statues by covering them with wax. DR JEKYLL AND MR. HYDE - Paramount made this stfilm twice. Once in 1920 with John Barrymore playing the leading part and then again in 1931, with Frederic March as the man that was two men, based on RLStevenson's fantastic novel. THE MIRACLE MAN - This film was also done twice. First in 1919 by Mayflower Film, with Betty Compson, Thomas Meighan, and Lon Chaney. Paramount remade it in 1932 starring Karloff, Sylvia Sidney & Chester Morris - Story written around a country village Patriarch who claims that he's a faith healer, and performs miracles by curring cripples.